British family 'shot dead in Costa del Sol' The UK Foreign Office is "urgently" looking into media reports that three British people have been found shot dead in a rented apartment in a southern Spanish resort. "> The UK Foreign Office is "urgently" looking into media reports that three British people have been found shot dead in a rented apartment in a southern Spanish resort. The UK Foreign Office is "urgently" looking into media reports that three British people have been found shot dead in a rented apartment in a southern Spanish resort. A spokeswoman had no further details. Spanish media reported that the dead people were a couple and their daughter in her 20s. A Spanish police spokesman said they "were almost sure they are British". The incident happened in Mijas near Fuengirola, Costa del Sol, media said. The Guardia Civil spokesman in Madrid said: "We are waiting for information from the judicial police at the scene. "We are led to believe there were two adults and one younger person." The bodies were found by the owner of the apartment complex. They have been removed from the building and a cordon has been established by police. The reports of fatal gunshot wounds have not been verified. 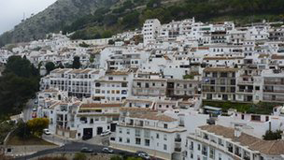 Mijas is a popular resort, inland from the Andalusian coast.